From the bad old ghost of High Park. The newspaper reported that a phantom rider not only emerged (several times, one could assume,) from the pond, but then rode roughshod through the streets and yards of Parkdale... giving Toronto's West End it's own glorious ghostly phantom rider. 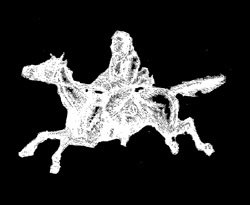 According to the article, "he" (the reporter only refers to the rider in the masculine,) arrives out of a mist that forms over Grenadier Pond at night... which becomes thicker and thicker and eventually begins to form and look like the ghost of a man and horse emerging from the water. (Another relation to the ghosts looking up skater's dresses on the pond?) Apparently, the ghost moans and groans and starts off at a gallop through the park, "riding down pedestrians" (one has to assume knocking them out of the way of his path...) while traversing the park paths and eventually streets of Parkdale. The article goes on to say that the local children that saw the rider noted he was giant, his head beading, eyes ablaze, and the horse snorting steam in its exertions. The paper even stated the horseman rode over policemen in Parkdale causing quite a sensation. The writer even specified that the men at Number 6 Station (Toronto Constabulary) were on the hunt for the rider and the report ended saying that the ghost's capture would likely be reported shortly. I have to admit, in the almost twenty-years of collecting stories and reports online, as well as through publications, I had not heard of this phantom... and it well could be a one-off story, to frighten children and gain readers, placed almost tongue-in-cheek by The Daily Star, but as someone dearly interested in the legends and myths of the province, this really intrigued me and came out of the blue. The reporter who brought it to my attention (Hina Alam) wondered if we had heard of any follow up or could offer information... which at present, we cannot. We can say that since 1997, we have not had a report matching this one... but with the old tale of the ghost under the water in Grenadier Pond and the soldier's suspected of hiding in the woods between Colborne Lodge and the pond, perhaps it is part of the larger legend(s) of the park.